Simply put, "Montgomery Drive" refers to the street in Miami that I grew up on. This is a place where I spent countless hours wandering and searching throughout my life during both good and bad times. In 2004 I began writing music as "Montgomery Drive" but it wasn't until late 2005 that I actively began recording and performing under that name. When I began "Montgomery Drive", there were never any set goals or things I was hoping to accomplish besides self-expression. Since that time, I've been fortunate enough that my music has provided opportunities that have allowed me to travel to various parts of the world and perform for different audiences both near and far. This past March I traveled to Japan a week after the Earthquake/Tsunami with Unfair Roots as the first group of American Musicians to tour the island following the disaster (watch the full video playlist below). Although the primary goal of "Montgomery Drive" will always remain self-expression, I would love for people across the globe to feel personally connected to it. Even though this is something I'd like to accomplish, it is not something I would compromise my artistic integrity to gain. Furthermore, the connection with my audience is the best reinforcement and show of appreciation I can ever and have ever receive. "Montgomery Drive" is my outlet, a vessel I utilize in order to deal and/or cope with life and the experiences involved. For myself, it serves as a very therapeutic way of expressing very personal matters. 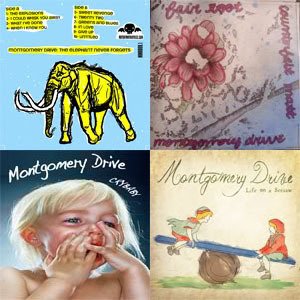 It is extremely important to me that anyone who connects and/or enjoys the sounds of "Montgomery Drive" can easily find, own, and share those sounds with anyone. As of this writing my discography includes four releases. These releases include: The Elephant Never Forgets, Fair Root/CounterfeitMatt Split, Crybaby, and Life On A Seesaw. The Elephant Never Forgets is a collection of early recordings and b-sides from 2004-2008 that was a limited release on cassette through the Kentucky based indie label Mayday! Mayday! Records. Most of the tracks included on that release are one-track live recordings that were later rerecorded for future releases. The Fair Root/CounterfeitMatt Split was a release through After Sweet Kiss Records to coincide with a Winter Tour in 2010 featuring Fair Root (aka Unfair Roots), CounterfeitMatt, and Myself. Crybaby was a completely instrumental release that was self released on cd and released on cassette through the Boston indie label BEAR Records. Lastly, the Life On A Seesaw recording was a self released EP that was released to coincide with the March/April 2011 Japan Tour. Although I just finished the tracks for my next two releases (both of which are splits that will be coming out later this year) Life On A Seesaw is my latest release that is currently available. As for the next two releases, the first split will feature Heffa Peppa, Rosetta Setta (MD), The Mad Skeleton (FL), and Myself. The second split will feature Love Ocean (MI), Ascia (CA), Colk (CA/JPN), Yui Daiki (JPN), and Myself. In addition to those splits I am currently finishing writing new material for some other special releases. As new albums are released I will add them to my site so remember to come back and check out what's new, subscribe to my YouTube page, like me on Facebook, follow me on Twitter, and keep smiling there's much more on the way.